Think with your other head, and you're screwed. Thus far, Gameloft's iPhone Apps are copies of other games. Bubble Bash is Bust-A-Move, Diamond Twister is Bejeweled 2 and our featured game, Brain Challenge, is a Brain Age clone, not that that's a bad thing. If anything, Gameloft's talented programmers continue to prove that imitation is the sincerest form of flattery, as they find new ways to spruce up older games. In this case, Brain Challenge is a fun little mind bender that may not improve your IQ, but its varied assortment of mini games are a fun way to pass the time. Unlike Brain Age, which embarrasses gamers by informing them that they have 80-year old brains, Brain Challenge attempts to measure the percentage of use. You select from one of two doctors, the hot babe Dr. Hurley and Professor (why is there a dude in this game) Stevens. Each of them walks you through your daily exercises, which consist of various tests that measure Logic, Math, Memory, Visual and Focus. In addition, there's Stress Training, just in case you find yourself plotting your boss' demise or accidentally breaking pencils during staff meetings. Some of these games are similar to other brain games. Trout Route, for example, shows you an incomplete equation and asks you to fill in the missing number. Bouncing Ball, on the other hand, tosses some balls onto the screen and challenges you to select the one that travels highest. Some are more fun than others, but with 43 mini games and three difficulty levels, you should find more than a few things to entertain you. 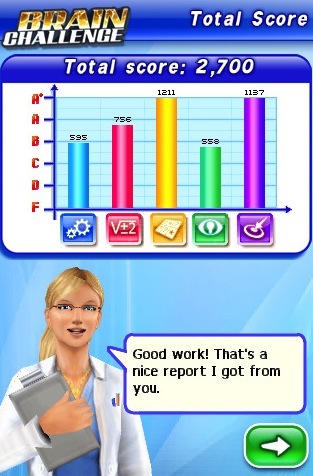 Furthermore, the game records your Brain and Stress test results, letting you compare times as well as your progress. Like most of Gameloft's iPhone Apps, Brain Challenge looks and sounds great. Its bright colors and polygonal instructors go well with its loud music. Numbers, shapes and attractive backgrounds aren't the best iPhone can do, but considering the material, the developers did a fine job. Combine everything with easy to use and responsive touch screen controls, and Brain Challenge is one of the iPhone's best Apps and ideal for eggheads looking to stay sharp. Now all we need is for Gameloft to shave a couple bucks off its $9.99 price tag. What's Hot: 43 challenging mini games, great music and graphics, hot female doctor, excellent touch screen controls. What's Not: Male doctor (this games needs more women), we don't feel smarter.